The plan has been harshly attacked by the regions of Valencia and Murcia which want their own transfers from the Ebro river. The cabinet on Friday approved the plans to pipe water from Tarragona to Barcelona, which the Government continues to insist is not a trasvase or transfer. During the election campaign the Socialists said they were against such transfers, and now they describe the construction of a new 60km pipe between Tarragona and Barcelona, to take drinking water to the latter as a water conduit. The plan has a budget of 180 million € and is expected to be ready in the Autumn. The water being moved from Tarragona is being taken from the mouth of the Ebro river by a system which is already in place. Speaking to the press after the cabinet meeting, Deputy Prime Minister, María Teresa Fernández de la Vega, said that the new measure was temporary and sustainable. She said that it was the best solution to the problem as it did not involve taking an extra drop of water from the Ebro river, and that it would be used until a new desalination plant for Cataluña came online. She said it would be unforgivable and irresponsible not to ensure water for Barcelona which was in an emergency situation, which meant that without water taps in the city could run dry in October. The new plan has not been welcomed by either Valencia or Murcia, where the PP controlled regional governments have joined forces to demand their own new water transfer pipe be laid from the Ebro river. Doubts have also been raised by the Socialist region of Aragón, which considers the measure goes against the Regional Statutes. Murcia and Valencia have threatened to place an appeal before the Constitutional Court against the Governments plans to run a new 60km long pipeline from Tarragona to Barcelona to supply the city of Barcelona with drinking water. The planned pipe will be fed from an existing feed to Tarragona which takes water from the mouth of the Ebro river. During the election campaign the Socialists said that they would not be transferring water in such a way, and the regional governments of Murcia and Valencia are now demanding that their dry regions, and that of Almería, also be served by such pipelines. Dam problem. International practice has moved away from the construction of large dams because of their serious environmental and social effects, say the experts. It is no longer considered acceptable to move mountains in order to get from one place to another. The ongoing conflict over the diversion of the Acheloos River in Aitoloacarnania in western Greece is now in its final stages, as environmental groups, local organizations and the residents of Mesohora, Trikala, have acquired a new ally, in addition to the Council of State, that could just swing the balance in their favor. 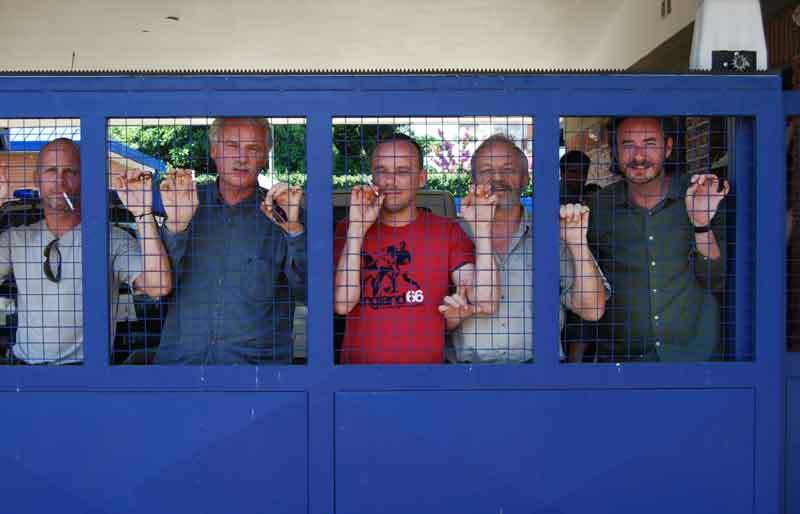 The European Union has left open the possibility that it could take action. Its opponent is Greeces Environment and Public Works Ministry, along with cotton farmers in Thessaly, who have been promised that the diversion will turn their dried-up plain into a paradise on Earth. The ministry has boosted its arsenal with legal and scientific arguments in a bid to ward off yet another referral, which would be the seventh on the Acheloos, to the Council of State, the countrys highest administrative court. In the national water resources management plan presented last week, the Achelooss diversion is no longer being described as a necessity, as it has been in the past, but as a given, expected to begin operating within the next three or four years. It has been 40 years since the project was first touted. Since then much has changed  first and foremost, the climatic conditions. The orientation of the Greek economy has also been altered, the emphasis shifting away from agriculture. The scale of human intervention in nature is also different  these days we no longer cut away mountains to build highways; protecting the environment is now an important factor in the design of any project. The conservation and protection of ecosystems is a priority in European and national policies  not without good reason. These are the arguments being raised by opponents of the diversion. Experts and politicians  many of them from the two major political parties  describe the diversion as being an outdated approach to public works and dangerous to Aitoloacarnanias ecosystems and even pointless, since the cultivation of cotton does not seem to have any future. What is illogical is that these arguments cannot be used to block the project, as any intervention can only be on the basis of legal irregularities, and that is what the ministry appears to be depending on. What could upset the balance is the involvement of the European Union which, after a series of allegations, has been quietly investigating the issue. Environment Commissioner Stavros Dimas, in his two most recent visits to Greece, held discreet meetings with representatives of environmental organizations and groups opposed to the diversion. He wanted to find out to what extent the project violated European environmental legislation in practice (the environmental effects studies, which in some cases are tailor-made to suit the purposes of the Environment Ministry, are not sufficient proof). Environment and Public Works Minister Giorgos Souflias is aware of that fact and is preparing his defense. The diversion of a river is not contrary to European legislation, as he correctly pointed out a few days ago. In response to a question from Eurodeputy Dimitris Papadimoulis a few months ago, Dimas said that transporting water from one administrative area to another has to be based on achieving efficient use of water, managing demand... retrieving cost, the principle of the polluter pays and a transparent decision-making framework. He also criticized current farming practices, emphasizing that these should be aimed at conserving natural resources, not exhausting them. What remains to be shown is whether the ministrys intentions are sincere or whether all the new arguments (regarding supplying water to towns in Thessaly, saving the Pineios River, restoring underground water reserves, and changing farming practices) are simply excuses. The problem is that if that is so, the effects will be difficult to reverse, not only in Aitoloacarnania. on the Occasion of the International Day of Action Against Dams and for Rivers, Water and Life. Yann Arthus Bertrand tourne depuis le 16 février en Argentine pour son émission "Vu du ciel" sur le thème 'La mort des grand fleuve" . Il a invité Roberto Epple, le président de European Rivers Nework - Loire vivante de l'accompagner pendant les 12 jours en Amérique du sud. Nous travaillons en Argentine sur l'émission "Vue du Ciel" pour France 2, le sujet "La mort des grands fleuves". Et comme toujours nous abordons des problématiques mondiales à travers la beauté d'un pays. Après trois jours de tournage à Iguasu. Survol des chutes d'eau (les plus belles du monde), du parc national et quelques interviews, tout se passe pour le mieux. Excellentes relations avec l'agence de tourisme qui s'occupe de nous "Cuenca del Plata" et qui va nous suivre pendant toute la durée de notre voyage de 10 jours à Buenos Aires puis dans le sud de l'Argentine. Nous continuons notre tournage dans la ville de Posadas pour parler du problème du barrage de Yacyreta qui est, selon l'ancien président argentin Menem, "un monument de corruption". L'après-midi, nous faisons des interviews très violentes des derniers habitants du village d'El Brete qui ne veulent pas quitter leurs maisons alors que le niveau de l'eau doit encore monter de 5 mètres. Depuis 10 ans, ils résistent malgré la pression et les menaces de la police. Ils nous parlent aussi de la construction d'un nouveau barrage "Corpus Christi" qui malgré un vote officiel de 90% contre des habitants de la province va quand même se faire. Depuis notre arrivée dans le village, nous sommes suivis et observés par la police. L'hélicoptère qui devait filmer le barrage est interdit de vol et cloué au sol par les autorités. Le soir même, en rentrant a l'hôtel notre agence de voyage locale nous demande de manière péremptoire de payer l'intégralité du voyage en "liquide" alors que nous en sommes à trois jours de tournage et qu'elle va recevoir un virement bancaire important de France. Ce tournage nécessite des sommes importantes. Il n'est pas question pour nous de transporter une valise remplie de billets de banque. Le lendemain matin, nous continuons notre tournage dans le village d'El Brete et nos 3 caméras sont suivis discrètement par des voitures de police. Notre tournage terminé, nous allons à l'aéroport pour poursuivre notre voyage dans le sud du pays avec toujours la même agence de voyage qui entre temps a reçu la confirmation du transfert bancaire. Et là tout bascule, les accompagnateurs très très nerveux refusent de poursuive le voyage avec nous et nous donnent le dossier pour continuer sans eux. Dix minutes après, une quinzaine de policiers envahissent l'aéroport et nous font comprendre que nous sommes arrêtés. Un fourgon de transport de prisonniers est avec eux. Nous sommes transférés à la police de Posadas où l'on nous notifie qu'une plainte pour escroquerie a été déposée contre 11 membres de l'équipe par l'agence de voyage locale. A 23 heures, nous sommes transférés après 4 heures de route au poste de police d'Iguasu. Et le lendemain matin, nous sommes entendus par le juge et libérés sous caution avec interdiction de quitter la ville d'Iguasu sans même pouvoir rencontrer la personne qui nous accuse et qui est partie en voyage. Nous apprenons par la suite avec stupeur que deux nouvelles plaintes sont déposées par des personnes que nous avions interviewées et avec qui tout s'était très bien passé. Nous comprenons très vite que ce n'est malheureusement pas un simple malentendu mais une véritable machination qui nous dépasse. Comment expliquer qu'une équipe entière est arrêtée pour escroquerie alors que, par exemple, le preneur de son ne peut pas être tenu pour responsable de l'organisation du voyage... Si ce n'est que pour être vraiment sûrs que nous ne puissions plus tourner. Et pour la tentative d'escroquerie, après des années de tournage dans le monde entier, serions-nous assez inconscients pour mettre en péril le déroulement d'un tournage avec des moyens aussi lourds en ne payant pas l'agence de voyage qui a l'entière responsabilité de l'organisation ? Pour les O.N.G. locales qui se battent aux cotés des expulsés du barrage, il n'y a aucun doute, les autorités veulent faire pression sur nous en stoppant le tournage et nous interdire de parler de ce scandale du barrage de Yacyreta. Pour l'heure, nous avons toujours l'interdiction de quitter le territoire argentin. 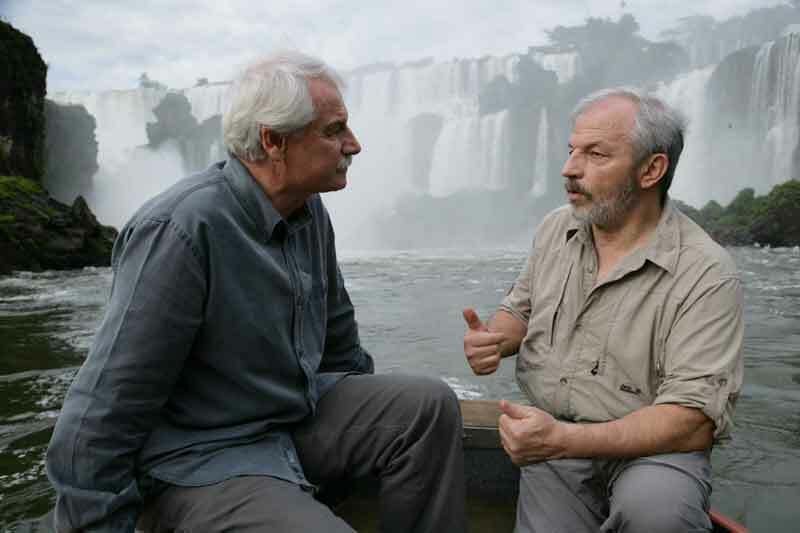 Famous french photogropher Yann Arthus Bertran is currently in Argentina working on his feature length documentary, during the filming he and his film crew will be visiting locations such as the Iguazu Falls, Perito Moreno Glacier, Parana river, Yasireta Dam, Buenos Aires Estuary, Bariloche site and many other locations,The footage from these locations will be part of "vUE DU DU CIEL" (France 2 TV Channel) and a Feature Film produced by Yann and tentativily titled Boomerang. The films are shot using state of the art Gyro Stabilized camera equipment mounted on a helicopter called a Cineflex V14, During the filming in Iguazu Falls the crew were stopped by the Argintinian Police and detained for 28 hours for admnistratif reasons, Yann and its crew have been released to continue filming on february 21. Turkey's breadbasket, the Konya Basin, was once known for its beautiful lakes, but now Lake Aksehir - formerly the size of three cities - has turned to dust and others are threatened, warned geologist Dr. Guler Gocmez of Selcuk University in Konya. Across the Mediterranean, groundwater is being pumped at a far greater rate than nature can replenish it. The European Commission is sending France a final written warning alerting it that it will be taken to the European Court of Justice (ECJ) for the second time and possibly face fines unless it quickly brings its waste water treatment up to EU standards. France is still not complying with the 1991 EU directive on urban waste water treatment, despite having been condemned by the ECJ for this. Environment Commissioner Stavros Dimas said: "Untreated urban waste water is a threat to European citizens and detrimental to the environmental quality of Europe's rivers, lakes and coastal waters. I urge France to act swiftly otherwise the Commission will consider asking the Court to impose fines." Larger towns and cities across the European Union are required to collect and treat their urban waste water under the EU Urban Wastewater Treatment Directive. Untreated waste water can be contaminated with harmful bacteria and viruses and thus present a risk to public health. It also contains nutrients such as nitrogen and phosphorous which can damage freshwaters and the marine environment by promoting excessive growth of algae that chokes off other life, a process known as eutrophication. The main type of waste water treatment envisaged by the directive is biological or 'secondary' treatment. The deadline for this infrastructure to be operational was 31 December 2000. If waste water is discharged into sensitive water bodies, the directive requires stricter 'tertiary' treatment, involving removal of phosphorous and/or nitrogen. This should have been in place by 31 December 1998. The Commission is sending France a final warning for failing to comply with a 2004 European Court of Justice (ECJ) ruling on the treatment of urban waste water in certain sensitive areas. Under the ruling, the ECJ condemned France for failing to designate eleven areas as sensitive and for inadequate treatment facilities in a number of settlements which discharge their waste waters into these areas. The ECJ also found that 121 settlements breached the directive by discharging their waste waters into previously designated sensitive areas. In 2006 France designated the eleven areas as sensitive. However, 140 settlements  including the city of Paris  continue to discharge into these sensitive areas. With regard to the 121 settlements discharging into the previously designated sensitive areas France proceeded to rearrange them into 164 settlements, resulting in some settlements no longer meeting the threshold level of 10,000 residents at which the directive applies. The Commission considers such rearranging of settlements to avoid compliance with the directive unacceptable and calls on France to implement the directive in all settlements covered by the ECJ ruling. In May 2007 France notified the Commission of the settlements' status and its agenda for complying with the ruling. It appears that some remaining settlements will not be equipped with waste water treatment facilities before 2011, some seven years after the ECJ court ruling and 12 years after the deadline set by the directive. The Commission finds this delay deplorable and urges France to build waste water treatment facilities in all concerned settlements as soon as possible. Should France not respond satisfactorily to its warning, the Commission may ask the Court to impose fines on France. The directive uses the technical term "agglomeration" which means an area where the population and/or economic activities are sufficiently concentrated for urban waste water to be collected and conducted to an urban waste water treatment plant or to a final discharge point. La Commission européenne a décidé d'envoyer à la France un dernier avertissement écrit par lequel elle l'invite à mettre rapidement ses installations de traitement des eaux résiduaires aux normes européennes pour éviter d'être poursuivie pour la deuxième fois devant la Cour de justice des Communautés européennes (CJCE) et de se voir infliger une amende. La France ne respecte toujours pas la directive communautaire de 1991 relative au traitement des eaux urbaines résiduaires, bien qu'elle ait été condamnée par la CJCE pour ce motif. lire aussi le texte anglais ci dessus !